Streaming...the final frontier! Ahead of the September 25 premiere of Star Trek: Discovery, Netflix reveals fans’ favorite episodes of Star Trek. 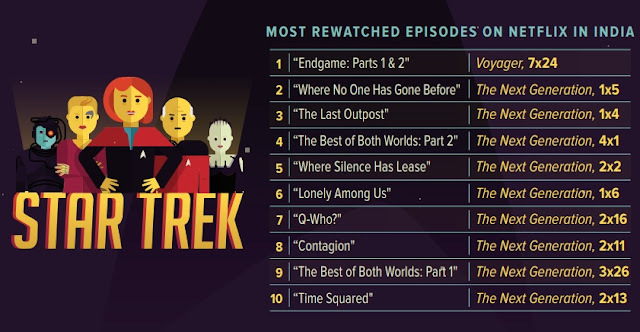 With 695 episodes of Star Trek currently beaming on the streaming service, Netflix now brings meaning to a strange new world uncovering which episodes are getting revisited the most. Computer: How many members have watched all 695 episodes of Star Trek on Netflix? Better set phasers to stun, because nearly 12,000 fans have spent over 536 hours (or 22 days) watching Star Trek. Netflix data also reveals that Voyager boasts the most revisited episode in the universe: “Endgame: Parts 1 & 2” (Season 7, Episode 24) is the most re-watched episode in the entire franchise. Indian Trekkies clearly agree, since this is the episode that they return to most frequently as well. Make it so! Not surprisingly, the first episodes of a series will usually be the most watched. However, looking beyond the first two episodes of any season one in the collection, it’s fascinating (as Spock would say) to see which episodes get watched over and over. It turns out that episodes that introduce iconic races, characters (Q, anybody? ), or captains tend to be re-visited most. And of course, time travel, alien abductions or crossover episodes are big winners with Star Trek fans. Inquiry: What collection is the most popular on Netflix? It’s not so simple. While The Next Generation and The Original Series have bigger audiences,Voyager and Deep Space Nine fans are better repeat customers, more likely to return for their favorite episodes. Despite fans’ mixed emotions on Voyager, plenty keep returning to the series. In the end, each collection has its merits: Original Series debuted Klingons, TNG set the stage for DS9 and Voyager, DS9 took Star Trek into serialized territory, and Voyager had the first female captain. And with all episodes on Netflix, fans can decide how and when they watch each voyage. The journey into the unknown doesn’t stop there. On September 25, Netflix will exclusively premiere Star Trek: Discovery in 188 countries (excluding the US and Canada). Discovery features a new ship and new crew, while embracing the same hope for the future that inspired a generation. Engage! 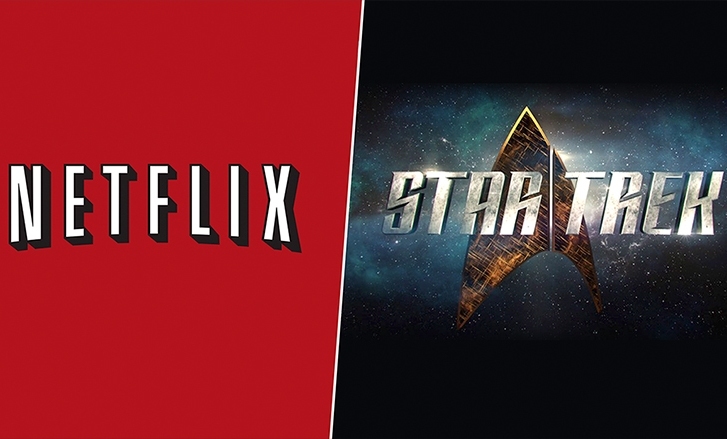 Netflix analyzed the viewing data of 104 million members across 190 countries who have watched the following Star Trek series on Netflix: Star Trek: The Next Generation, Star Trek: Enterprise, Star Trek: Deep Space Nine, Star Trek: The Original Series, Star Trek: Voyager. In an attempt to look for data beyond default behavior, the first two episodes from any season ones were omitted from the data. “Rewatch” is defined when a member returns to watch at least 6 minutes of an episode they had previously completed.